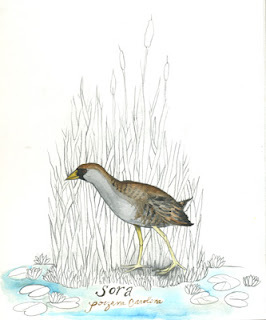 More often heard than seen, the Sora, like other Rails, is very secretive, and prefers to stick to hiding in the cattails. Soras are in the family Rallidae. Rallidae (includes Virginia Rail - see earlier post for Jan.), Gruidae(Cranes) and Aramidae(Limpkins) are Gruiformes. Gruiformes are a group of species that tend to inhabit freshwater marshy wetlands. Soras, for being so secretive, have pretty big mouths. One of their calls is an eerie, high squealing whinny that descends sharply in pitch. Hiking near freshwater marshlands during the breeding season, one can hear their song lilting out of the cattails and carrying across the prairie to announce springtime. Spring - I could use a little of that right now!